[ULYSSES S. GRANT]. FRANKLIN D. CALLENDER. 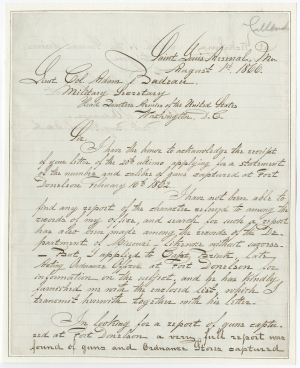 Manuscript Letter Signed as Lt. Col of Ordnance and Brevet Brigadier General, to Adam Badeau, Grant’s Military Secretary, St. Louis, Arsenal, Mo., August 1, 1866. 2 pp., 7¾ x 9½ in. 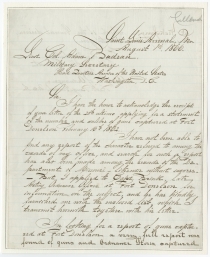 Callender responds to Grant’s aide-de-camp Adam Badeau’s request “for a statement of the number and calibre of guns captured at Fort Donelson, February 16th 1862,” the Tennessee battle that was Grant’s first success. Not having that report, he offers one on Vicksburg instead. Franklin D. Callender (1817-1882) Union officer; after distinguished service in the Seminole War and Mexican War, took command of the St. Louis Arsenal in 1861 and served as Chief of Ordnance of the Dept. of the Missouri [Nov. 19, 1861-Mar. 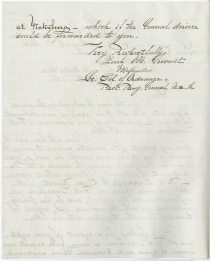 11, 1862]; holding same post in Dept. of the Miss. [March 11 - July 11, 1862], he returned to Mo., where he was on the Governor’s staff and then served in the advance upon and siege of Corinth; returned to Dept. of the Mo. and the St. Louis Arsenal July 11, 1862 and commanded it throughout the war; breveted B.G. USA for Corinth, St. Louis, and war service.